The Y&R Update Tuesday 7/6/10--Canada; Wednesday 7/7/10--U.S.A. In the hospital, Paul tries to get Patty to tell him if she was actually present at the murder of Hightower, but she is still over the edge. When he tries to tell her that Adam was in the hospital, it doesn't help things. Sharon arrives at the prison, thinking that Nick has summoned her, but it is Adam. She is surprised, to say the least. He knows that she wouldn't have come if she'd known it was him. She goes to leave, but he stops and asks her to listen to him, since she used to care about him. Adam is surprised that she didn't go to court right away when she got back, but she says that she wanted to see her daughter. Sharon and Adam argue about his fake mental breakdown. He tells her that he isn't a killer. She reminds him that he's done a lot of disgusting things and skipped town, and he admits that. He still insists that he didn't kill anyone. Sharon gets a phone call from someone, telling her that Patty confessed to the murder. Adam pretends to be shocked and points out with a heavy sigh (putting on an act for Sharon) that Patty was very angry at him. Adam keeps pleading with Sharon to believe that he's not a cold-blooded murderer. Sharon is clearly torn and doesn't know what to believe. Upset, she ends up yelling at Adam to leave her alone as she leaves the jail. At the club, Billy runs into Victor after having a flashback to Adam telling him to hire Rafe as his lawyer. Billy mentions that he'd heard Nick is out of jail, but Victor doesn't want to give him any more Newman dirty laundry to put in his magazine. Victor continues to berate and insult Billy, who just keeps chuckling. Billy points out that Victor was certainly quick to grant an interview when it suited his purposes. Victor doesn't want Billy writing any more articles that help Adam. Billy bristles at Victor trying to tell him what to write. 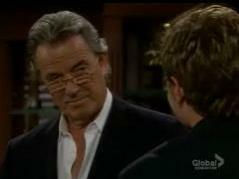 Victor warns him not to interfere in his helping Nick. Victor tells Billy to have a double tequila on him (knowing that Billy can't drink) and leaves. 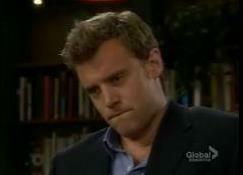 Billy phones Rafe and tells him that he needs to talk to him. Rafe meets Billy at Restless Style. Billy asks Rafe to represent Adam. Rafe can't believe he's asking that and wonders why Billy would even want him to. Billy tells him frankly about the interview. Billy persuades Rafe that he will look good in court with such a high-profile case, whether he wins or not. Rafe doesn't agree but doesn't turn him down, either. It's clear that he is being swayed by Billy's words. Billy sees Sharon as he's going to visit Adam with Rafe, and she is leaving. He can tell she's upset, so he offers to chat with her as a friend. They go to Restless Style, and she notes that she hasn't been there in a while. She confides that she hopes to find some good in Adam, if nothing else because of what it says about her for marrying him if he's a monster. Billy protests that Adam has lied to everyone. Rafe talks to Adam about his case. Adam is his usual charming self. Rafe wonders why he should represent him. Adam points out that Rafe could use the fame and fortune. He says that everyone has a price. Rafe tells Adam off, saying he would never take his case. He just wishes that he could take it, and tank it, but he has too many ethics. They trade more insults. Rafe leaves, and Adam curses. Emily and Jack are happily sitting on the couch. She got her medical license back, thanks to her brother confessing. They spent the night together, too. Jack wants to savor the moment, he tells her, and they kiss. Paul visits the Abbot mansion. He tells Jack and Emily about Patty's confession, which surprises them. Paul also shares his suspicions that Adam somehow got to her and what Patty said about Satan tormenting her. Victor stops by to chat with them about Patty as well. Paul asks Emily if she could talk to Patty to try to get the truth. Jack is against the idea, since Patty put her through so much. Victor is for the idea, of course, since it could get to the truth about Adam. They all argue about it. Emily wants to do it. Jack points out all that Patty has put her through, but she insists on doing it. Meanwhile, in the hospital, Patty is still ranting and raving about the devil making her do it, and that she doesn't want to go to hell. Emily and Paul go in to see Patty. Emily asks Patty about her confession and tells her that Adam was in the hospital. She assures Patty that she wasn't just seeing him in her head. She asks Patty if Adam scared or threatened her into confessing. Patty thinks it through and admits that perhaps Adam did do that, although she doesn't remember the details. She also still remembers stabbing him and seeing him die. Jack and Victor keep arguing. Paul phones Jack to tell him that Patty still remembers clearly stabbing Adam. Jack and Victor takes turns blaming themselves for what happened. J.T. carries Mac outside and puts her down by the pool. She is missing the twins. She is glad that she could carry them for Cane and Lily, but she didn't know how hard it would be to give them up. J.T. consoles her and makes her feel better, holding her hand and kissing it. J.T. brings her some water. Mac puts herself down for trying to fix things by carrying the babies. J.T. reminds her that it did work (even if it did destroy her relationship with Billy), and that Lily would be dead if not for her. Mac is very emotional and overwhelmed. J.T. sits next to her on the chaise lounge. He. tries to cheer her up by joking about how bad her future will be. She does end up laughing and smiling. Mac tells him that she loves him, but then she realizes what she said and gets embarrassed. J.T. looks touched. She says it was just the hormones talking. J.T. jokes softly that she can't take it back. Then he leaves his face forward, so their foreheads are touching, in a very tender moment. He tells her sweetly not to worry, that he doesn't love her, either. They smile at each other. Lily gets her cancer treatments in the hospital. She looks at photos of the babies on her phone. Cane knows it's hard for her not to see the babies while she's getting her treatments. Neil assures her that they'll take lots of video of the babies so she won't miss anything. Neil and Cane are very positive about the treatments working. Lily is not so sure. She feels fortunate, though, that the twins were both healthy, even though they're premature. She asks Cane to go check on them for her, so he gives her a quick and then leaves. Neil tells Lily that he wants to focus on things that matter, so she worries that he quit Chancellor. He laughs and assures her that he's not an idiot. He sold Indigo, and he broke up with Ashley. She is sorry to hear about both. Ashley helped him realize that he could meet someone special like Dru again and fall in love. They both miss her, but Lily tells him that she wants him to be happy, too. Neil pets her shoulder as she smiles at him. Neil is amazed at how calm Lily is. She knows that this treatment is her last chance. He doesn't want to hear that. She knows that she did everything she could, and he agrees that she has fought hard. She confides that she was afraid she would never see her babies, but now that she has, she is filled with joy. If she dies, she can die happy. She looks up at him radiantly, with a big smile. Neil looks down at her sadly and kisses her hand. Cane looks in on the babies and talks to them lovingly about Lily as he takes videos with his phone. Later, the nurse takes out the I.V., so Cane and Neil give them privacy. Lily stands up and then faints, scaring everyone. Lily just got up too quickly. She tells them that she had a feeling that someone was lifting her up and that everything was going to be okay. 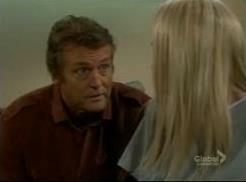 Billy and Sharon discuss the murder case. She still wishes she knew the truth. She thanks Billy for lending his ear and leaves. Billy takes out a photo of Sharon, saying that it is perfect for the story. He now has his damsel in distress.